During the election season, the Russian-made helicopters will probably be given to people like the prime minister by the Indian Air Force as they go on the campaign trail. Russia-made military transport Mi-17 V-5 helicopters will ferry VVIPs in India during the election season, DNA reported on its website on Monday. This comes in the wake of the Indian government cancelling an order for 12 AgustaWestland AW101 choppers, over corruption allegations between Italian businessmen and their Indian intermediaries. Sources from the Indian Air Force told DNA that the scrapping of the helicopter deal was a setback since the proposal to replace India’s fleet of Mi-8s was taken 14 years ago. 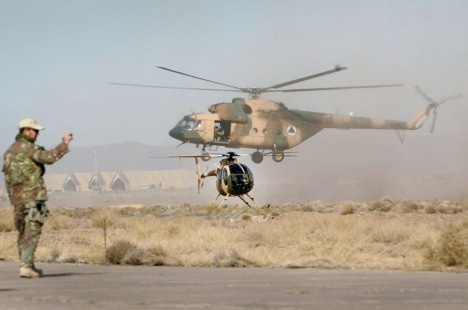 The Mi-8 helicopters used by the IAF will be phased out by next month, according to the paper, which, citing sources added that there were no immediate plans India to buy new helicopters at the moment. “We are looking at the possibility of upgrading the Mi-17 V-5 fleet because the IAF is not getting AW101. The Special Protection Group (SPG), the elite force which handles the prime minister’s security, will be consulted to overview the upgrade as per their specification,” the paper cited an IAF officer as saying. India ordered 80 Mi-17 V5 helicopters from Russia in 2008 for Rs 7,700 crores ($1.2 billion), which were expected to be delivered by the end of 2014, DNA said, adding that a follow-on clause was invoked to buy 59 more choppers for about $893 million. Developed from the basic Mi-8 airframe, the Mi-17 was fitted with the larger TV3-117MT engines, rotors, and transmission developed for the Mi-14, along with fuselage improvements for heavier loads. Optional engines for 'hot and high' conditions are the 1545 kW (2070 shp) Isotov TV3-117VM. In May 1999, during Operation Safed Sagar, the Mi-17 was used in the first air phase of the Kargil War by the IAF. It is highly unlikely that a new global tender would be issued afresh for the VVIP choppers given the fact that India’s parliamentary elections are just months away.